"No one throws a party like Sandals & Beaches Resorts, and no one knows how to party like our guests, especially our Sandals Select guests who come back year after year to cut loose at the disco or rock n’ roll on the beach. That is why every year, Sandals Select Rewards plans its annual Reunion Week just for Sandals Select members – 5-days of pure fun, parties and good times. This year Sandals kicked it up a notch with two Reunion Weeks, its annual spring Reunion and a special fall Reunion to Celebrate Sandals 30th Anniversary. Welcome Home Cocktail Reception - Light drinks and finger foods. 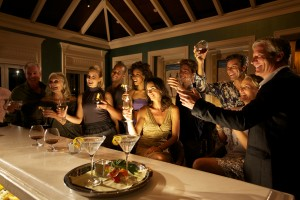 Off-Property Excursion - each resort will organize a special tour or off-property activity. Elegant Four-Course Gala Dinner - this dinner will be an enhanced version of the weekly returning guest dinner, including a free week prize giveaway. ‘El Dorado’ Zinc Shac’ Caribbean Party (All SSG’s Members) - Final Blast Dinner Buffet, dancing."